Six tips every parents needs to know because starting family daycare. Almost one year ago to the day, my then 11-month-old son Leo started at family daycare so I could return to work. I remember those first drop-offs as highly emotional times that involved a lot of tears; from Leo as he became more aware that I was leaving him, and me as I felt all kinds of guilt and worry about whether he would be okay. Fast forward to January 2019 and while Leo occasionally still gets upset after holidays or sick days, he is very happy to play and learn with his little friends every week. I certainly don’t worry anymore, and there is zero chance of tears from me as I whizz off to grab a coffee before going to work in peace. Starting any type of daycare will be a big change to your routine and Jessica Woodford, an educator with Jellybeans Family Daycare, advises that it is best to start slowly. 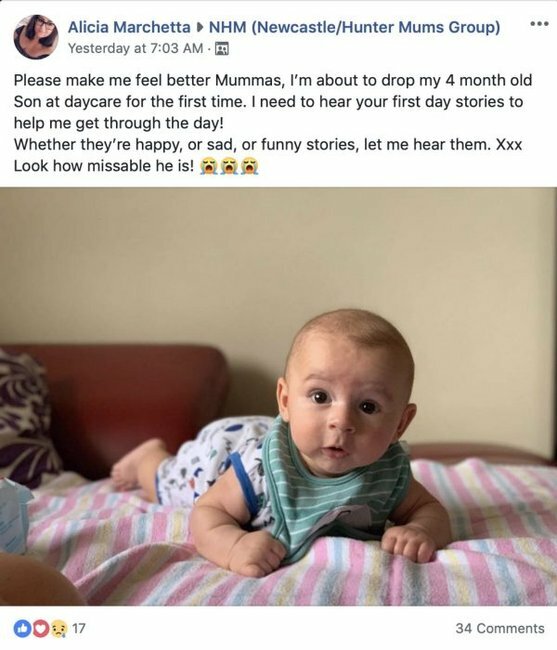 Alicia Marchetta, mum to baby Ace, decided to start him at daycare the week before she returned to work, to help them both feel more relaxed with the new arrangement. “I dropped him off and then spent the day pampering myself with some long-awaited hair and beauty appointments, which certainly helped me to enjoy my time away from him! 2. The first goodbyes are always hard: be quick, consistent and reassuring. Feeling anxious about how Ace would handle his new daycare environment, Alicia posted on a private parenting Facebook group seeking advice. “I was worried about how Ace would cope without me so I asked the group for some ‘first day stories’ and tips. Alicia reached out to a mother&apos;s group for help on transitioning her son into daycare. Image: Supplied. 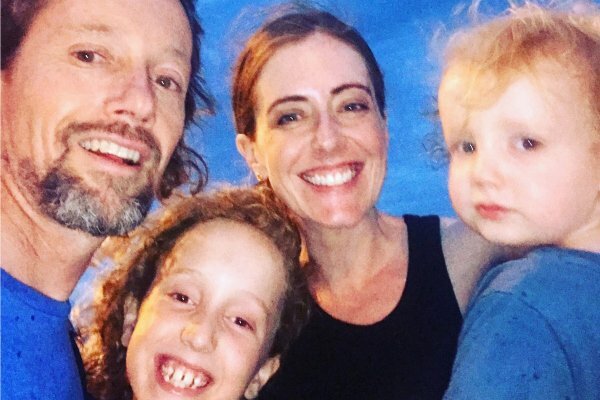 Lenora Newcombe, early childhood teacher and owner of New Lambton Infant Educare believes that if a child is showing signs of separation anxiety; acknowledgement and reassurance is key. It might seem like it is better to sneak off when your little one is distracted with a toy, but Lenora believes this is a common misconception for parents new to daycare. 4. Provide plenty of helpful information about your child. The more your daycare service knows you and your child, the better for everyone. Jessica says that when it comes to providing helpful information, an educator can never have enough. “I like the information written down so I can refer to it over their first few weeks. Things like the child’s favourite song, sleep routine, food likes and dislikes. While drop-offs are the element most parents dread about daycare, pick-ups can also be stressful if you spend too much time trying to locate lost items with a tired tot in tow. Lenora advises new parents to get into the habit of labelling everything clearly. This Canberra-based childcare centre is ticking all the boxes and will cook you dinner, feed your kids kale and quinoa and give you an espresso on arrival. Dream. While the transition to daycare can be stressful for everyone to start with (Jessica believes the second day can be worse than the first! ), it is a huge relief for parents when their children are finally settled and happy. After her initial feelings of guilt subsided, Alicia felt confident that her son Ace was in the right place. “Instead of feeling guilty all day, I focused on the positive aspects of sending him to daycare including that I can work knowing he is safe and that being at daycare is great for his development. Is your baby or child about to start day care? How do you feel about it? Any tips to offer other parents in the same situation? We’d love to hear from you in the comments section below.